SWA: The Sequel to Tonight's The Night? The Sequel to Tonight's The Night ? 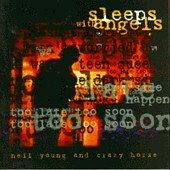 Neil Young's new album, _Sleeps With Angels_, has been the focus of much hype. Influential Rolling Stone magazine gave _Sleeps With Angels_ a 5 star review calling it "extraordinary". The album entered the Billboard charts at number 9 - one the highest debuts of any Young album. Until the release of _Sleeps With Angels_ , Tonight's The Night reigned supreme as Young's darkest and most intense album. And now it seems that _Sleeps With Angels_ is the 20 year sequel to _Tonight's The Night_, much as _Harvest Moon_ was the sequel to 1972's _Harvest_. First, there are the obvious similarities, which have been well publicized, such as Kurt Cobain's suicide being Sleeps With Angels 's title track influence. This parallels Crazy Horse guitarist Danny Whitten's O.D. and its shadow on _Tonight's The Night_. Thematically, Sleeps With Angels and Tonight's The Night are very similar - dark and brooding. But where Tonight's The Night was loose, raw, ragged, edgy and over the top, Sleeps With Angels is tightly wound, controlled, and hypnotic. The refrain of "Tonight's The Night" has been replaced with a repeated "Too soon, Too Late" in "Sleeps With Angels". Then there are the circumstantial and structural similarities between the 2 albums. Although not released until 1975, Tonight's The Night was Young's next studio album after _Harvest_. Similarly, Sleeps With Angels is the next studio recording after _Harvest Moon_. Both Tonight's The Night and Sleeps With Angels have 12 tracks. Both have black labels. Both were recorded in L.A., as opposed to Young's normal recording location of the Northern California area. Both albums have a "bookend structure". The bookends of Tonight's The Night are the title track which opens acoustic and concludes electrically. The bookends of Sleeps With Angels are the tack piano lullabies/ballads of "My Heart" and "A Dream That Can Last". The final link between _Sleeps With Angels_ and Tonight's The Night can be found on the single Piece of Crap which contains two versions of Tonight's The Night. 22 years later, the voice cracking, tequila soaked "Mellow My Mind" has been replaced with the grungy feedback of "Blue Eden". The flat out, no- holds barred Crazy Horse "Come on Baby Let's Go Downtown" is updated into the wildly silly but compelling "Piece of Crap". POC is a "Come on Baby Let's Go Downtown - and go SHOPPING!" Others have pointed out that Sleeps With Angels is like a symphony with movements. Rising and building, shifting gears, Sleeps With Angels is one of the tightest and most cohesive albums Young has ever released. Tonight's The Night has a similar structure and cohesiveness. Many of Young's albums are compilations of material written over various time frames and recorded intermittently. Not so with Tonight's The Night or Sleeps With Angels which were both written and recorded over a matter of weeks (with a few exceptions). Sleeps With Angels has the epic length "Change Your Mind" (lyrics analysis) anchoring its center while Tonight's The Night's linchpin are the 4 tracks "Roll Another Number", "Albuquerque", "Lookout Joe", and "Tired Eyes". It should be noted that the most optimistic song on Tonight's The Night - "New Mama" written for Carrie Snodgress who had just given birth to their son Zeke - interrupts the sequence. This interruption is similar to the role of the upbeat "Train of Love" has in the sequencing of the dark and eerie "Blue Eden", "Safeway Cart", and "Trans AM". But the clincher is the brilliance of "Trans Am" in relation to Tonight's The Night's "Albuquerque". Both songs are the key tracks of the 2 albums. "Trans Am" is a western ballad - a road trip with no beginning or end. The timeframe is ambivalent. One's first thought is that Trans Am is a car. But it becomes more complex as Crazy Horse plunges forward. Maybe it's a western hero TRANSiting across AMerica in his conestoga wagon? TA concludes in a modern setting of hotel lobbies, arms dealers and broken headlights. Heavy metaphors for what has gone wrong with the modern American Dream. "Albuquerque" plays a similar role in Tonight's The Night. It's another road trip where the travelers detour, deadend, and burnout. The richness, complexity and vibrancy of the lyrics echo in Trans Am 20 plus years on. Musically, the building intensity, cresting and falling of Young's guitar are eerily similar. In the liner notes for Young's magnum opus _Decade_, he wrote that "Heart of Gold" put him in the middle-of-the-road. But Young preferred the "ditch" - a rougher ride, but you met a lot more interesting people there." Longtime fans gamefully debate which direction Young will swerve next and often end up surprised - like everyone else by his uncanny ability to remain fresh and vital after nearly 40 albums. So is _Sleeps With Angels_ ditch? Certainly not in the deep ditch glory tradition of _Tonight's The Night_. Sleeps With Angels's spooky, detached feedback is the Tonight's The Night equivalent of playing from the soul and out on the edge of darkness. The opening and closing of Sleeps With Angels are more akin to the Harvest Moon middle of the road than anything one will find on Tonight's The Night. What is amazing is that Young can retrace paths 20 years later and produce stunning works such as _Harvest Moon_ and _Sleeps With Angels_. While many may prefer _Harvest_ or _Tonight's The Night_, Young will not disappoint the newcomers with _Sleeps With Angels_. See Just Another Line in the Field of Time page for a full lyrics analysis and discussion of the meaning of "Change Your Mind", Tonight's The Night and other Neil Young songs.